Trials was launched with the ambition of providing authors with the opportunity to provide all the necessary detail for a true and complete scientific record. It has long pushed for the communication of all outcome measures in health-related randomized controlled trials, as well as varying analyses and interpretations, and in-depth descriptions of what was done and what was learnt. An integral part of this was, of course, the publication of study protocols, which had rarely been possible in paper-based journals . A published protocol establishes precedence, allows more detailed discussion of methodological issues and can be referenced when reporting the main trial results . The increasing publication of study protocols is undoubtedly one of Trials’ greatest successes . However, despite recent movements towards greater transparency in reporting research, concerns remain regarding the widespread discrepancies between trial publications and what was stated in the original study protocol . Indeed, there is strong evidence that selective outcome reporting, with manipulation of the outcomes and analyses reported, is a common problem in medical research . This serves to highlight the importance of researchers having access to all of the relevant information, to reliably evaluate bias or selective reporting in clinical trials. The advent of trial registration has helped to mitigate, to some extent, the lack of connectivity by providing a unique identifier associated with each trial record. However, while major medical journals typically capture the clinical trial number on or before publication, many do not followTrials’ example by publishing it in the abstract, as is recommended by CONSORT for Abstracts and the International Committee of Medical Journal Editors (ICMJE) . The reader thus has to identify related content through a literature search, using titles, authors and the abstract; details that will not necessarily remain consistent, as the articles may be published in different journals, with different authors, over many years. 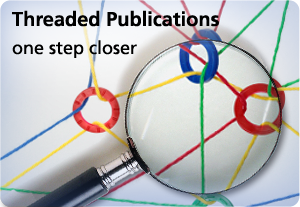 It was in pursuit of this ambition that, in partnership with CrossRef, BioMed Central called a cross-publisher meeting to discuss how to build on the well-established digital-object identifier (DOI) and the more recent CrossMark tool, which provides information on the status of the associated article and an additional publication record, to achieve the threaded publications concept . The meeting spurred the formation of a working group to govern the development of the project. Chaired by BioMed Central, the working group includes representatives from CrossRef, BMJ,Canadian Medical Associate Journal, the Cochrane Collaboration, eLife, F1000, the Internal Standard Randomized Controlled Trial Number (ISRCTN) Registry, The Lancet, Origin Editorial, the Public Library of Science, Springer, The Wellcome Trust and Wiley, and is overseeing the development of the first phase in the threaded publications concept, Linked Reports of Clinical Trials. The Linked Reports of Clinical Trials project will adapt the existing CrossMark standard to capture additional metadata about an article, namely the clinical trial number, the trial registry and the relation to the primary trial report, and associate that information with the article DOI on publication. A query to this CrossRef database will then return all articles related to that clinical trial number. As all the metadata will be open access (CC0 license), with no copyright, it will be possible to access this article ‘thread’ either through the CrossMark interface or independently through an application programming interface (API). A pilot evaluation of this system is set to begin towards the end of 2014, trialling how to adapt existing article workflows to capture these additional metadata prospectively and in an efficient and sustainable manner. For the initial pilot phase, only those articles for which the clinical trial number is currently required for publication by the publishers involved will be included; this includes study protocols and updates , statistical analysis plans , primary results papers and secondary analyses . Following successful implementation on this subset, the scope will be expanded to capture the clinical trial number for additional article types related to clinical trials, such as case reports of adverse events, commentaries and editorials. CONSORT: Consolidated Standards of Reporting Trials; DOI: Digital-object identifier; ICMJE: International Committee of Medical Journal Editors; ISRCTN: Internal Standard Randomized Controlled Trial Number; API: Application programming interface.